Why are we so fascinated by clothes that have been worn by the rich and famous? Kate Middleton’s wedding dress will attract enormous attraction when it is put on display (probably in Buckingham Palace). We will all admire the fabulous design and craftsmanship, but seeing the dress close up will also somehow make us feel closer to the person who wore it. Another iconic dress has recently been returned to public view. 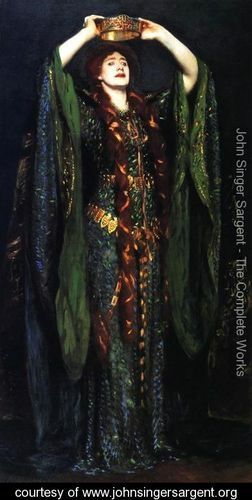 Ellen Terry’s costume which was made for her to play Lady Macbeth at the Lyceum Theatre in 1888 is probably the most famous theatre costume in existence. For many years it has been at Terry’s house at Smallhythe, Kent, but a couple of years ago was taken away for essential conservation. After a £50,000 plus refurb it recently went back on display. It wasn’t the only spectacular costume made for Terry, but it is easily the most famous. The reason for its fame is that a portrait of Terry wearing it was painted by John Singer Sargent, the finest portrait painter of the day. The painting was so admired that queues of people went to see it when it went on display, only a few of whom would have seen the play in the theatre. The painting remains one of the most popular exhibits at the Tate Gallery in London. The dress itself was amazing. In order to make it shimmer under the stage lights 1000 real beetle wings were individually sown onto the dress. Over the years the staff at Smallyhthe have collected the wings as they have dropped off, and wings have been gathered and contributed (the beetles shed their wings naturally so none were harmed). I went to Smallhythe about a year ago and was disappointed not the see the dress, though I liked the way that the reproduction of the dress was inventively decorated with false fingernails instead of beetle wings! The dress was intended to look like fine chain mail, and the beetle wings gave a metallic sheen. Unlike some of her costumes, the dress was delicately constructed and moved with her. Ellen Terry was noted for her energy and grace of movement on stage, captured in a sketch also by John Singer Sargent and illustrated on the website devoted to his work. The finished painting shows her in a pose which she never actually struck in the play but it successfully illustrated the essence of the performance rather than being an accurate rendering of it, and the dress looks sensational. Part of the mythos surrounding the dress relies on the reputation of Terry herself. She was easily the most successful actress of her day, and except for the Queen herself, the most famous woman in the kingdom. She was so loved that she got away with being married three times, having numerous love affairs and two illegitimate children, without being branded a strumpet. A real beauty, a talented actress, with great charm, she was also blessed with a compelling voice. This rare recording gives a flavour of it. It’s of a recital of “The quality of mercy” speech from The Merchant of Venice. John Gielgud, her great-nephew, in his book An Actor and his Time, recounts how in her later years, she often performed it at charity matinees. Her voluminous correspondence is currently being edited by Katharine Cockin, and her letters will eventually be published in eight volumes. If alive today she would probably be a great tweeter. This entry was posted in Legacy, Shakespeare on Stage and tagged Ellen Terry, John singer Sargent, Macbeth, Shakespeare, Smallhythe, The Merchant of Venice. Bookmark the permalink. I’ve just been reading that when he finished the portrait, John Singer Sargent told the designer of the beetle dress, Alice Comyns Carr, that she should have signed the portrait with him. Alice also designed a blood-red cloak for Ellen Terry to wear after the murder scene. Irving praised it at the dress rehearsal but to Ellen’s surprise he proceeded to wear it himself on opening night – she said it was due to his “dislike for being anywhere but in the centre of the picture”! Great story about the cloak. Irving must have sometimes felt upstaged by his leading lady!